The Ukrainian parliament or Verkhovna Rada has 450 deputies. Half of them are elected from party lists (where voters elect candidates from names on a list and the party decides the order of preference i.e. who is most likely to be elected) and the other half in single seat constituencies. A draft law has to have 226 votes to pass. 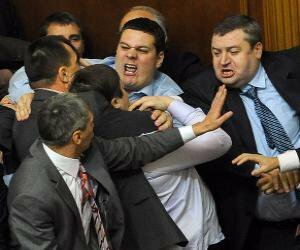 The Ukrainian parliament or Verkhovna Rada has 450 deputies. Half of them are elected from party lists (where voters elect candidates from names on a list and the party decides the order of preference i.e. who is most likely to be elected) and the other half in single seat constituencies. A draft law has to have 226 votes to pass. There are five parliamentary parties: the Party of Regions (202 MPs as at the time of writing), Batkyvschyna (90 MPs), Ukrainian Democratic Alliance for Reform or UDAR (42 MPs), Svoboda (36 MPs), Communist Party (32 MPs) and small non-affiliated parties have 43 MPs between them. The current ruling party is the Party of Regions (PoR). Its honorary leader is President Viktor Yanukovych and its Chairman, Mykola Azarov, was until very recently Prime Minister. One of Azarov’s deputies, Volodymyr Rybak, is the Acting Speaker of the Parliament. Many card-carrying members have government posts: Foreign Affairs Minister Leonid Kozhara is another Deputy Chairman of the party. The power vertical is thus made up of Yanukovych supporters. The government has always maintained, and still does, that this vertical gives it a clear advantage in the work it has to do. Many people still remember the internal conflicts within the ‘Orange’ team, when President Viktor Yushchenko was unable to find common ground with Prime Minister Yulia Tymoshenko. We should not forget that it was Yushchenko, not Yanukovych, who instructed the National Security and Defence Council to investigate the circumstances in which Ukraine signed gas deals with Russia in 2009. And it was during his presidency that Ukraine’s Security Services started collecting evidence against Tymoshenko, though it was Yanukovych who subsequently used this evidence to send Tymoshenko to prison for seven years. Logically, all these attacks on the power vertical by its own members should represent a threat to its existence, and this is indeed the case: Maidan’s main demand is that Viktor Yanukovych should resign as head of state, and snap presidential elections called. Ukrainian Communists have always made their opposition to PoR very clear. Strangely, however, whenever the 'Regionals' needed support for legislative initiatives, it was always the Communists who came to their aid. The last time this happened was in January, when laws were being passed which significantly restricted citizens' rights, in particular freedom of speech and assembly. These laws were voted in by 183 PoR deputies, 32 Communists and 19 from the non-affiliated parties (they have since been repealed). The Communists condemned the government’s substandard 2014 budget, but still voted for it. The government also enjoys the support of some of the MPs elected from single seat constituencies, many of whom won their seats in parliament with the covert, and sometimes even quite overt, support of PoR. But these MPs tend to vote on an ad hoc basis, and their decisions have little to do with the party line. The oldest opposition party is Batkyvschyna (Ukrainian for 'fatherland') whose leader for ever and a day has been Yulia Tymoshenko (currently serving a prison sentence). In 2012 the party merged with the Party for Change led by Arseniy Yatsenyuk. It's hard to say which side gained more from this merger: Yatsenyuk managed to get his people into Parliament, and Batkyvschyna acquired a leader who re-injected some life into the flagging battle with the regime. And Tymoshenko still has considerable influence within the party: she writes regular letters to her supporters and her defence lawyer Serhiy Vlasenko makes sure they are delivered. Another somewhat sensitive element in the relationship between the two concerns the rule that under Ukrainian law a convicted felon who has not completed his or her sentence is not entitled to stand as a presidential candidate. This, however, did not prevent the 2013 party conference putting forward Yulia Tymoshenko as a candidate for the presidency in 2015. Time is moving on and she has not been released, but there is still no other candidate, which is a source of tension within the opposition. 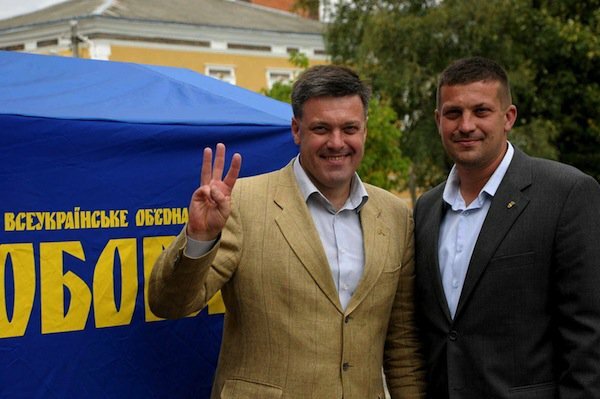 Svoboda is in favour of Ukraine once more becoming a nuclear power and of the death penalty. UDAR’s leader Vitali Klitschko has as yet little political authority. At meetings of party leaders, others (such as Oleksandr Yefremov from PoR) start smiling when he opens his mouth to speak. The government does not see him as a serious politician, but as a puppet deftly operated by other people, who are cleverer and able to think strategically. For this reason, it is quite difficult to understand which vision of Ukraine he is advocating. His calls to action are on the whole fairly general: life in Ukraine should be honourable and fair; violence should not be used on civilians; the economy should work for the benefit of the whole population. But perhaps it's just that – no confused and impractical plans for rebuilding Ukraine - as well as his tonguetiedness, that make him a politician who is equally popular in the west and the east of the country. All three opposition parties agree on one point: the government has to go and Yanukovych has to resign as president. Yatsenyuk, Klitschko and Tyahnybok are united on this and prepared, in public at least, to forgive each other a good deal. They are ready, for instance, not to notice, or not to give too much significance to, the demolition of the statue of Lenin in Kyiv (in private Klitschko was categorically opposed to this Svoboda action). They have a common goal and they must move towards it. 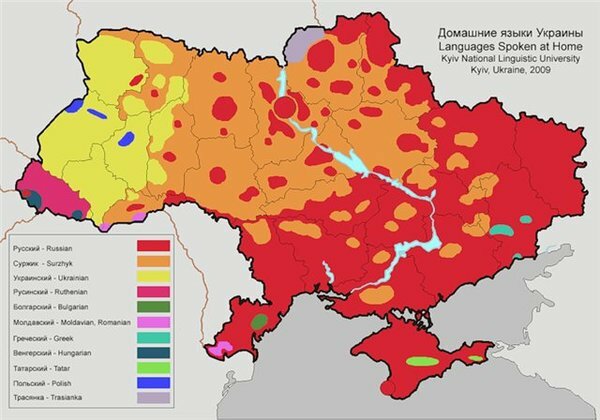 Maidan has really divided Ukraine. The values of the protesters in Kyiv are not always, and not wholly, shared by people in the (mostly Ukrainian-speaking) west and the (mostly Russian-speaking) east of the country. The latest data from the Democratic Initiatives Foundation and the Razumkov Centre show that 50% of Ukrainians support Euromaidan as a phenomenon; 42% do not. In the west of the country 80% are in support and 7% are not; in the east, the figures are 30% and 65% respectively. 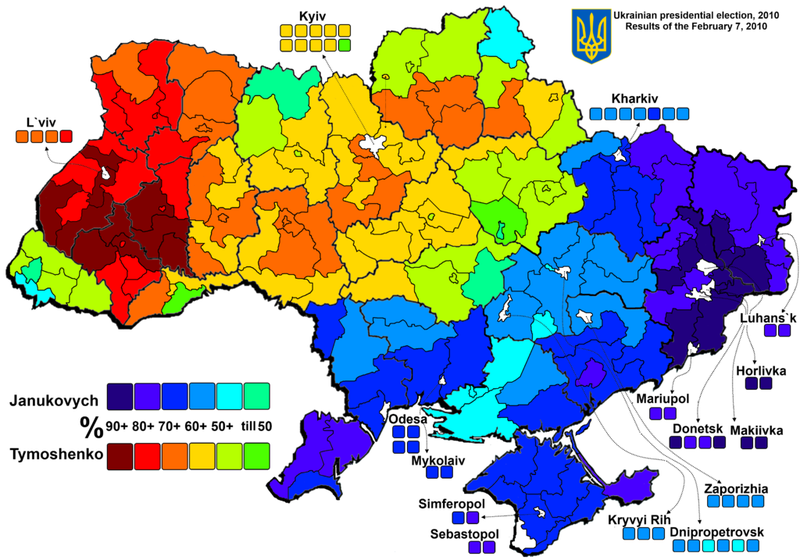 Though Ukraine is often viewed as having a 'Russophone East' and 'Ukrainophone West', in much of the country, a plurality report speaking 'surzhyk', a non standard mix of the two languages. Image via Kyiv National Linguistic University. Click to enlarge. When a compromise has been reached, everyone who is asked what they did during Maidan, or why they were against it, will answer 'I was fighting for Ukraine.' And it will be true. There is still a very strong wish to believe that 'Right Sector' and 'Ukrainian Front' are at the extremes of one and the same movement, that the Ukrainian government and the opposition will have enough wisdom and strength (and the chance) not to let the country slide into civil war. When a compromise has been reached, everyone who is asked what they did during Maidan, or why they were against it, will answer 'I was fighting for Ukraine.' And it will be true.